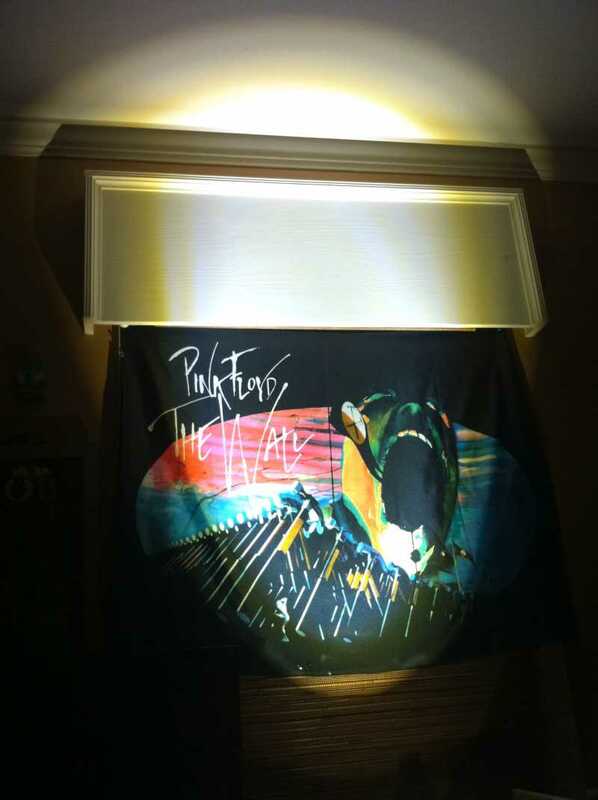 Named after the epic "Pink Floyd" song, but only to allude to the fact of how incredibly bright this LED spot/flood is ! 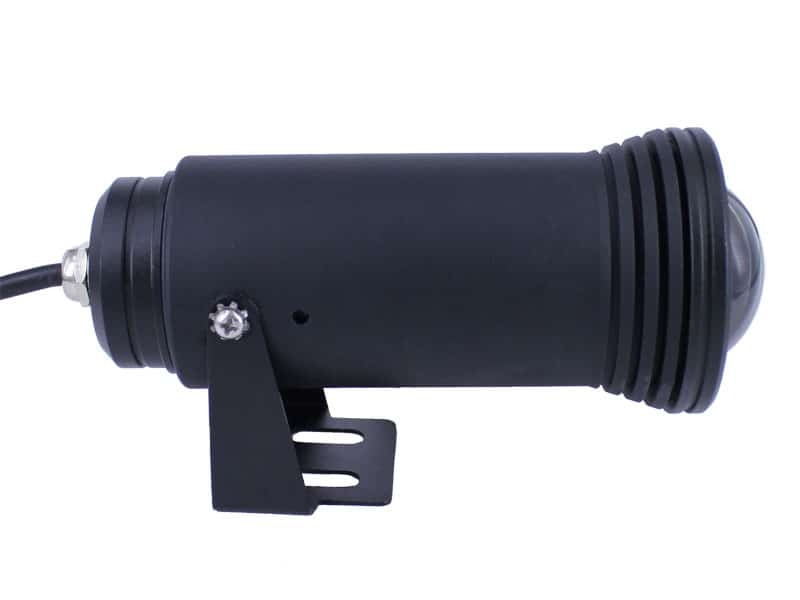 A fully loaded arsenal of lumens packed into an ultra sturdy & rugged solid-state aluminum LED fixture. 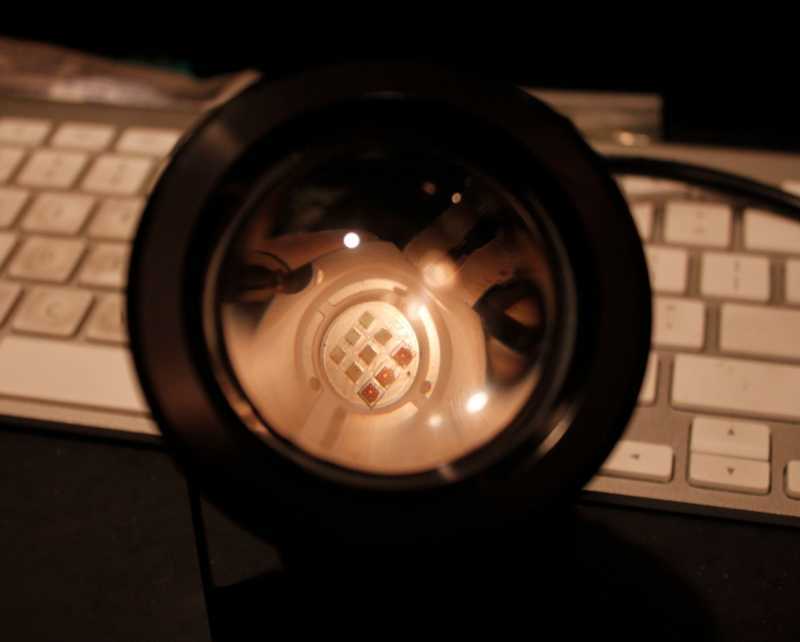 You'll be amazed by the sheer intensity and vibrance cast from this ground breaking new LED from Oznium. 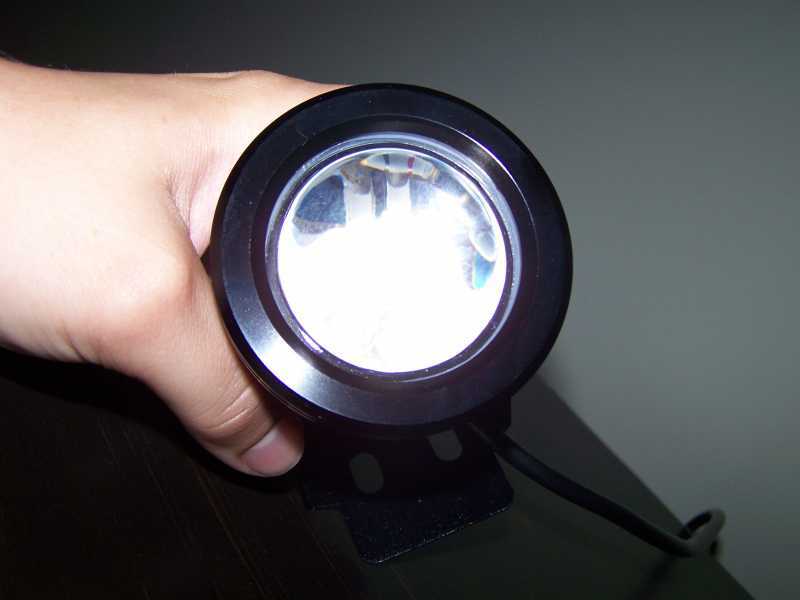 No need to use multiple smaller LED spotlights to "fill up" the light gaps in your project, as this solid-state beast boasts 10 watts of pure luminosity. 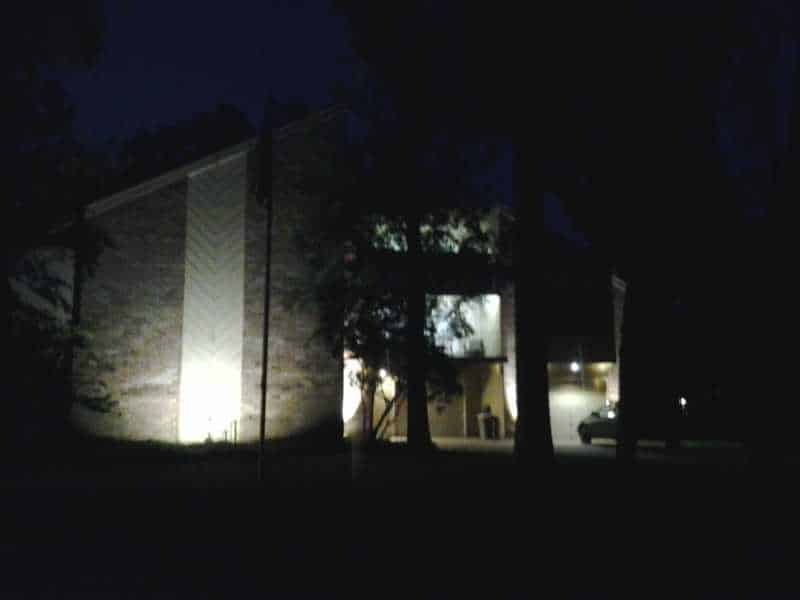 Need a less focused "spotlighting" effect and going for more of a "floodlight" look? 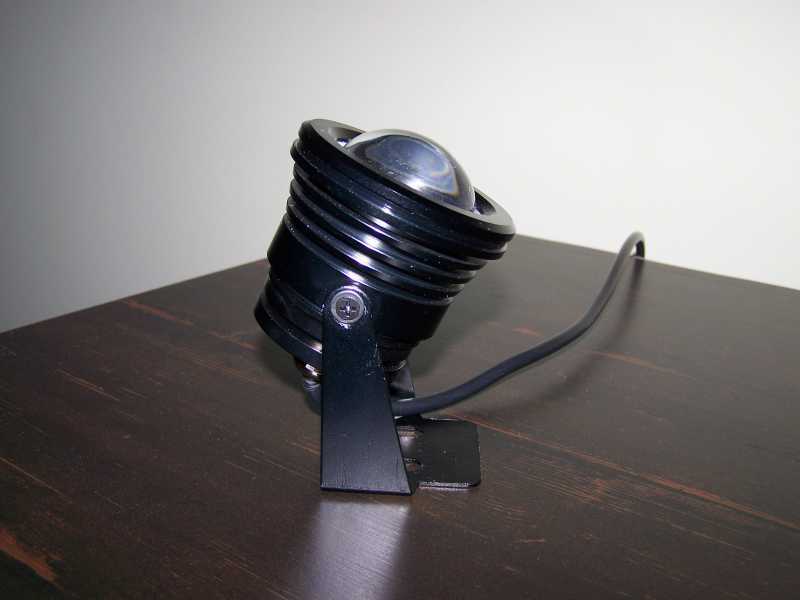 It's as easy as 1-2-3 : Simply unscrew the top of the spotlight, remove the domed glass-lens, and pop in the flat glass lens. 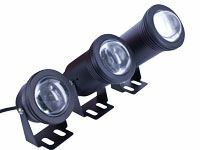 You now have a rampaging flood light that will throw out more than 180 degrees of sheer luminescence, the Eclipse™ is that versatile. 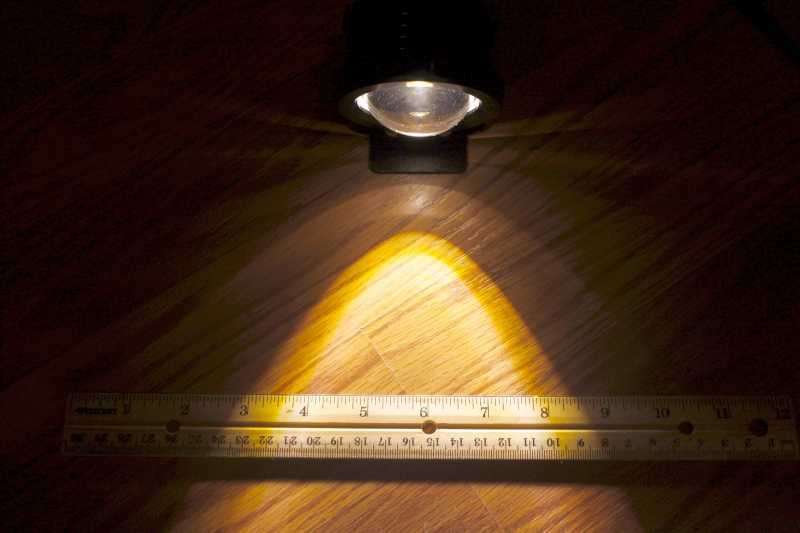 The spotlight lens gives a 60 degree beam angle of light. 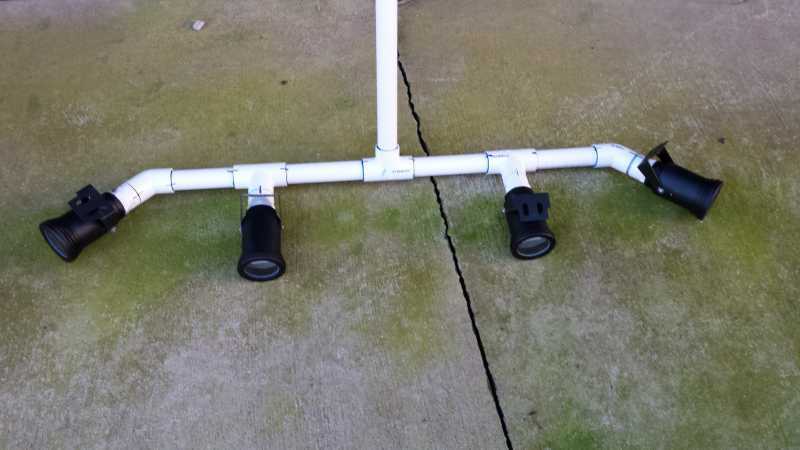 Need to wire it to a power source without cutting off the barrel connector? 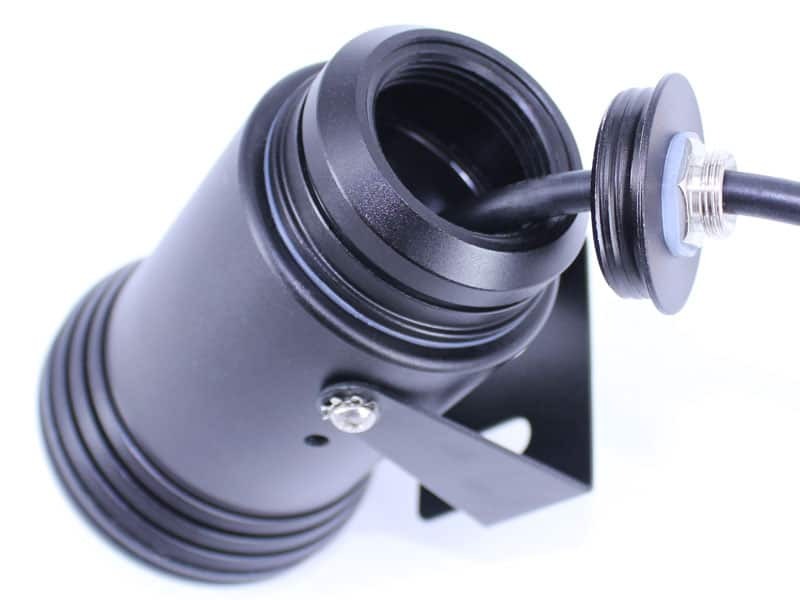 No problem, just buy one of the DC Barrel Adapters They come in 4 different styles. 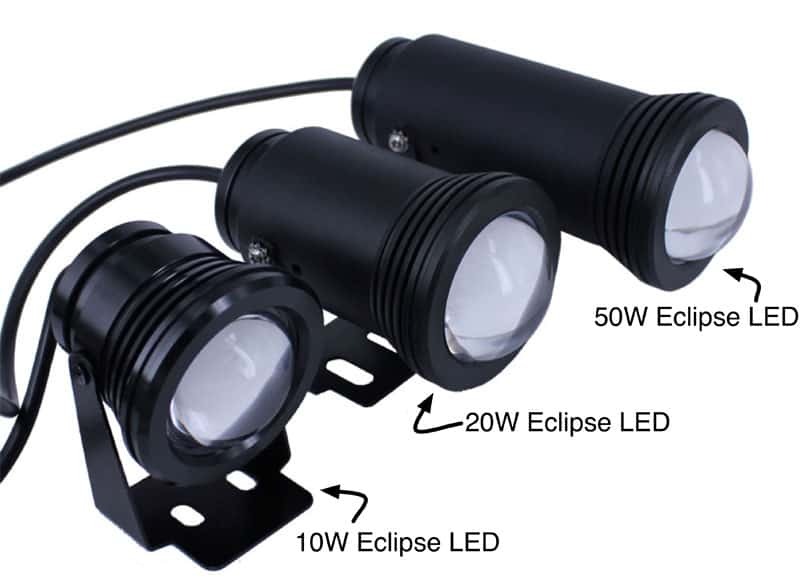 10W, 20W and 50W Eclipse Spotlights are available now. 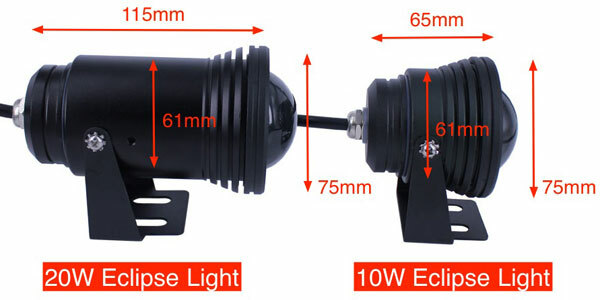 Share the same lenses: Diameter of the 10W & 20W eclipse lenses mounting rings are same. 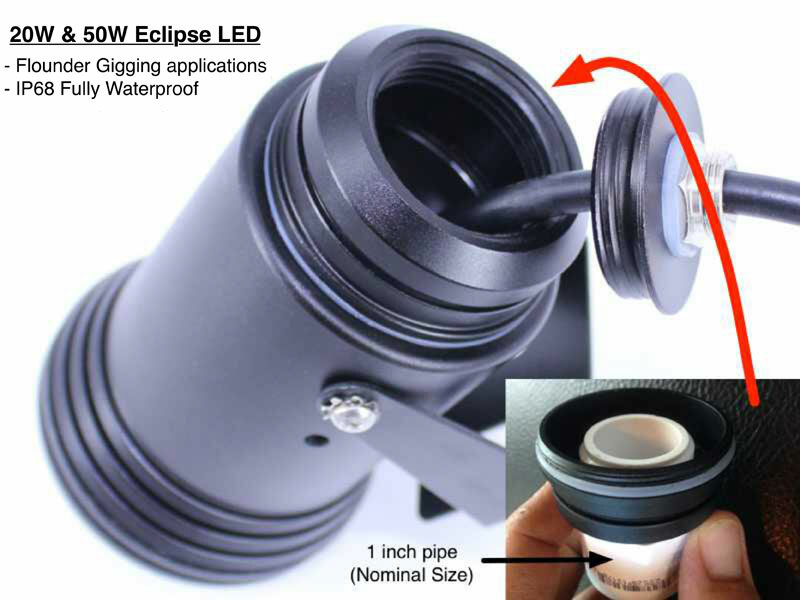 - 50W eclipse LED is needed to run under water for cooling, otherwise it will be too hot and burnt out. 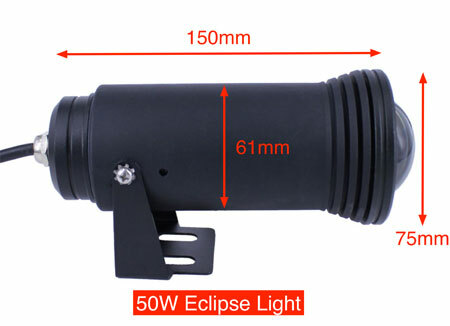 10W, 20W & 50W eclipse spotlight comes with the same lenses, flat & curved. 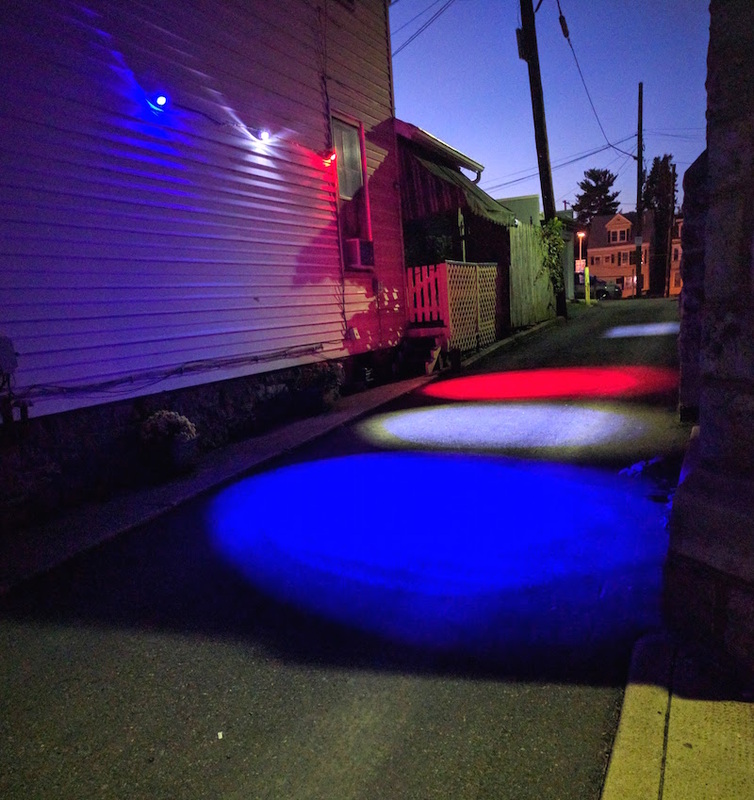 Customer John from Easton, PA displays patriotic colors: red, white, and blue with Oznium's 10W Eclipse Spotlight LEDs. 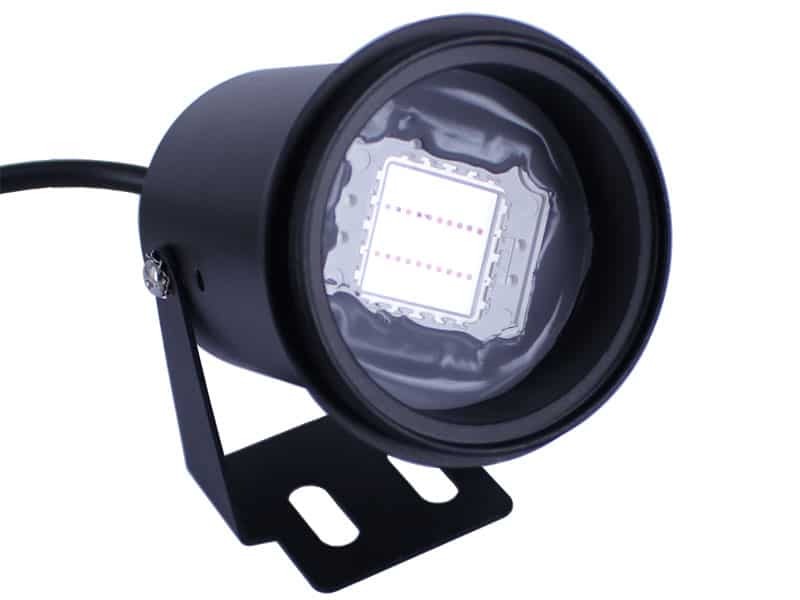 You are currently viewing Automotive applications for our Eclipse High Power LED. 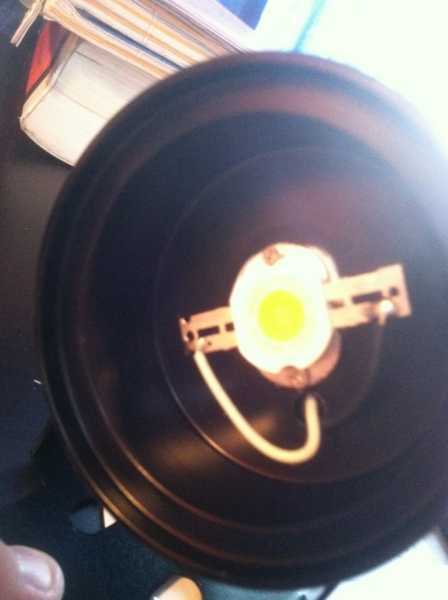 LED Spotlight Fixture Diameter (top) 2.75 in. / 6.985 cm. 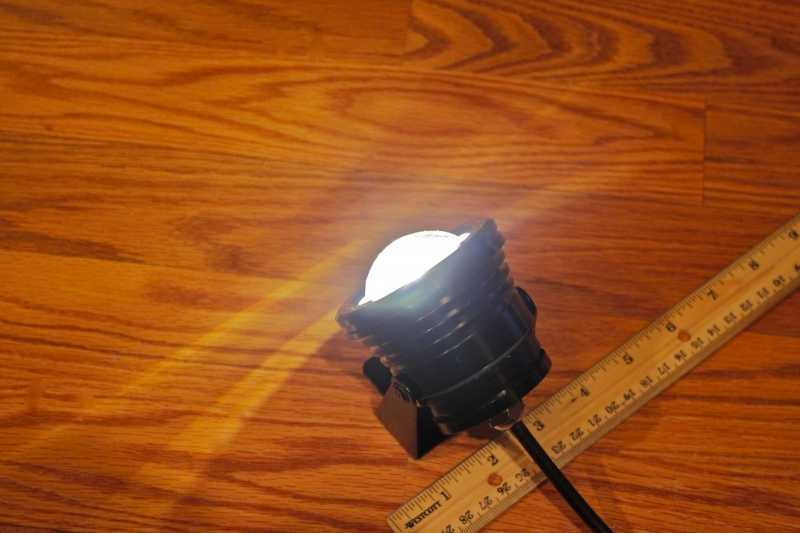 LED Fixture Diameter (base) 1.875 in. / 4.7625 cm. 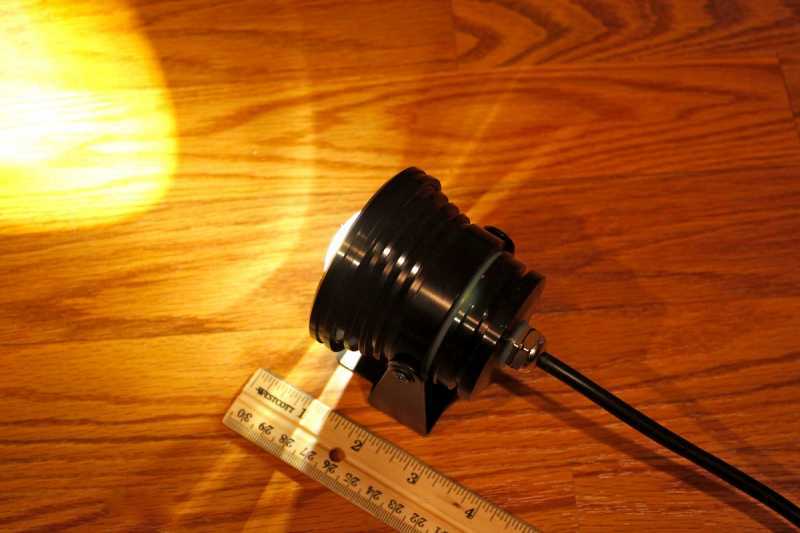 Glass Lens Diameter 1.96 in. / 4.97cm. Glass Lens Globe Protrusion 25 in. / 0.635 cm. 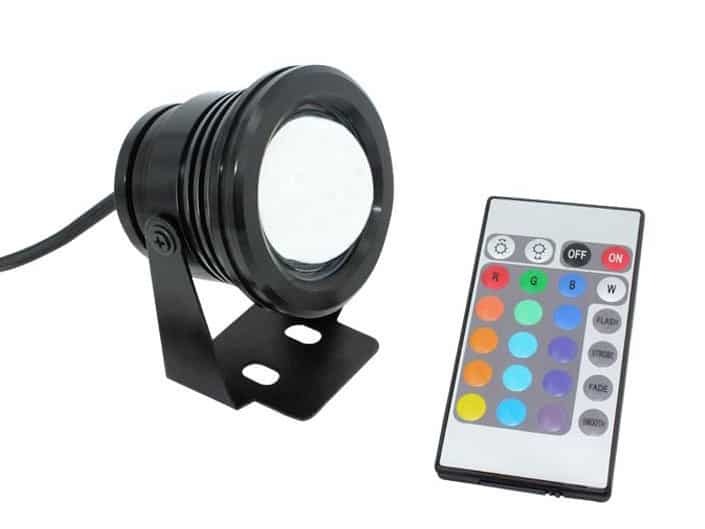 The "RGB w/ Internal Controller" has a built-in controller, and comes with a handheld infrared remote control to cycle through colors/modes. There's just two wires to hook up: 12v+ and 12v-. This is the only Eclipse has 4 wires, and no plug. All other's have just two wires and a plug. 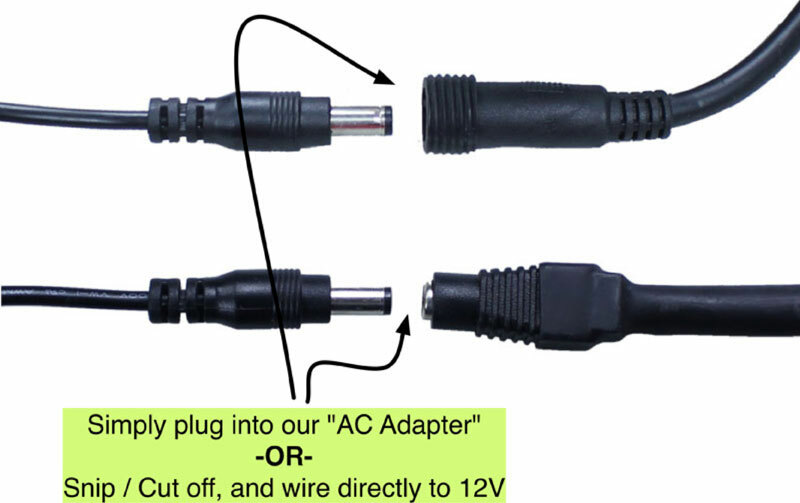 If you want to hook it up directly to 12V (to a portable battery, in a car, etc), you can always remove the power plug to access the bare + and - wires. You can cut off and discard the plug. 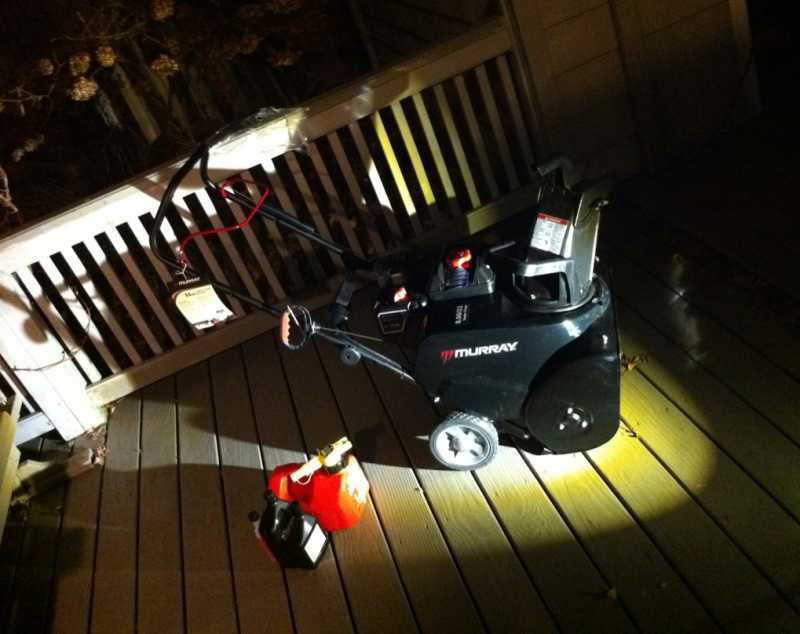 We put the plug on there for other applications such as hooking it up to an AC Adapter for in-home use. 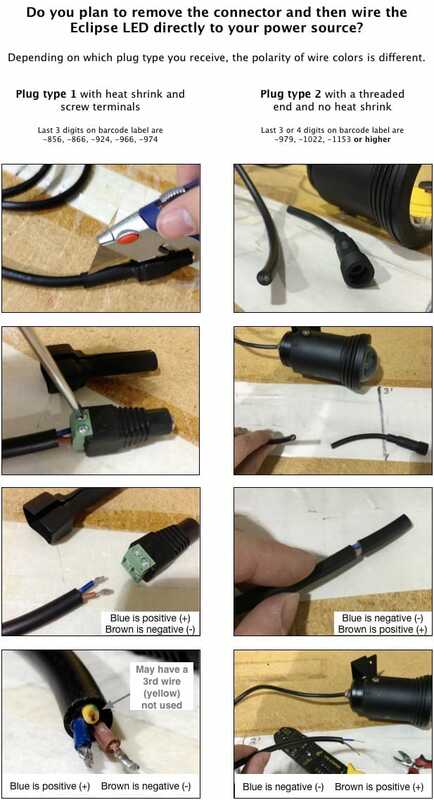 Carefully strip the outer black wire sheath, and then inner wires. 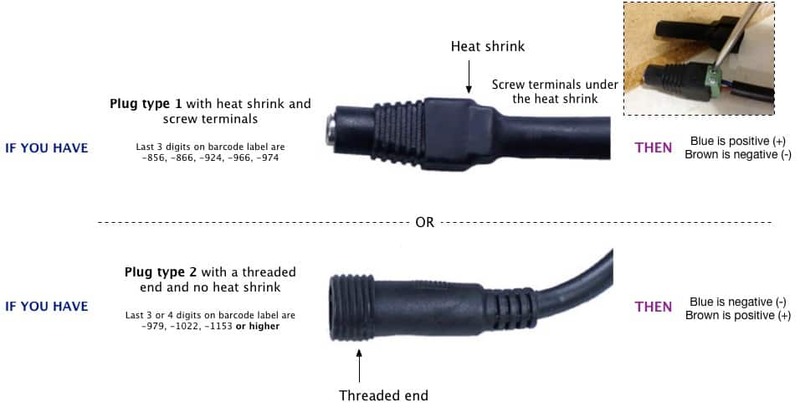 IMPORTANT: you MUST hook the wires up with the correct polarity. 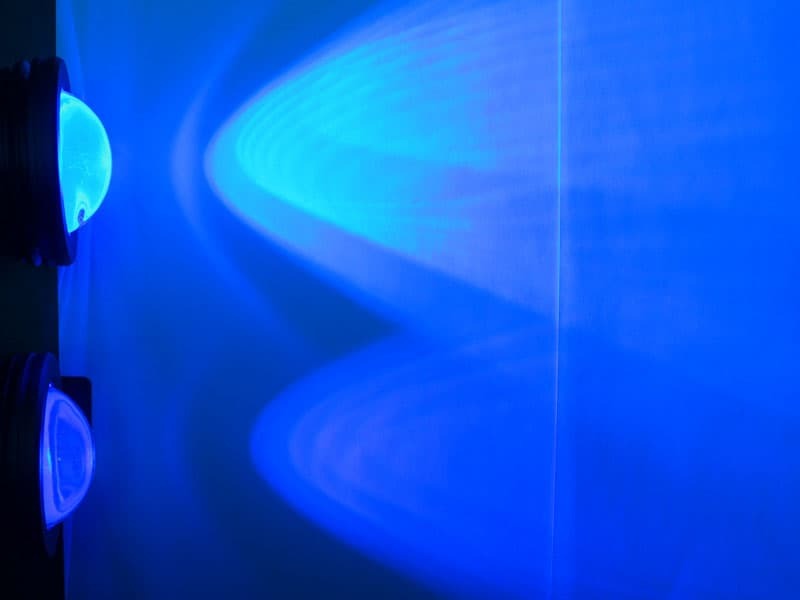 If you accidentally reverse them, even for half a second, it may permanently damage the LED. 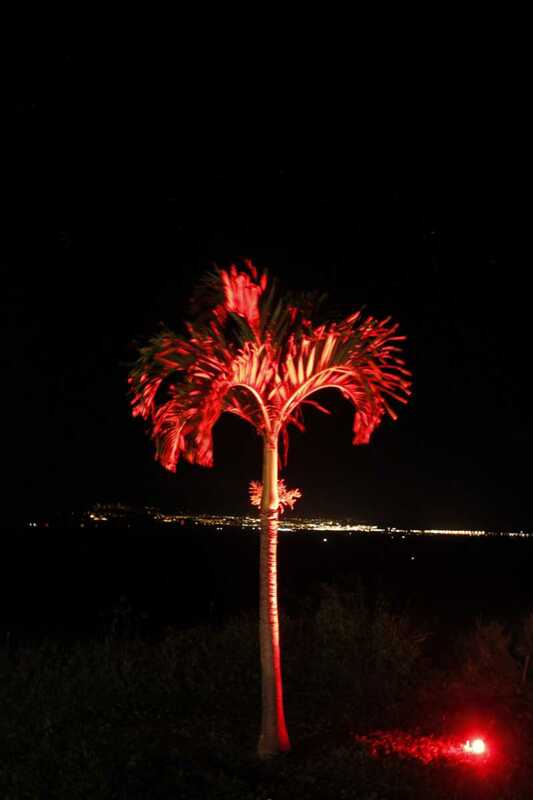 Our customers have asked 22 questions about this product. Let me begin by saying I didn't read the instructions thoroughly at all. I ended cooking my light accidentally. 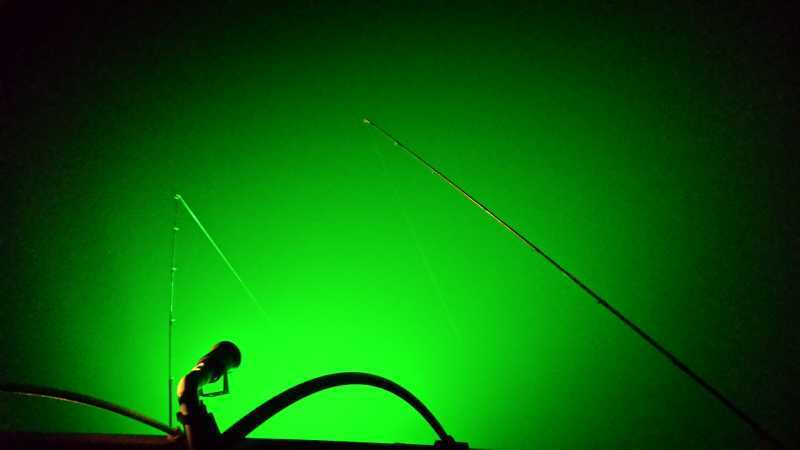 Susan was a a dream to work with and I hope to have my new light in soon to CORRECTLY hook it up and stick some flatfish! 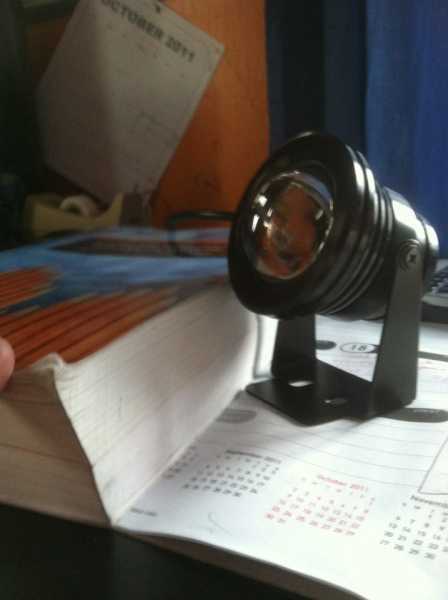 Oznium is tops in this guy's book for lighting needs! 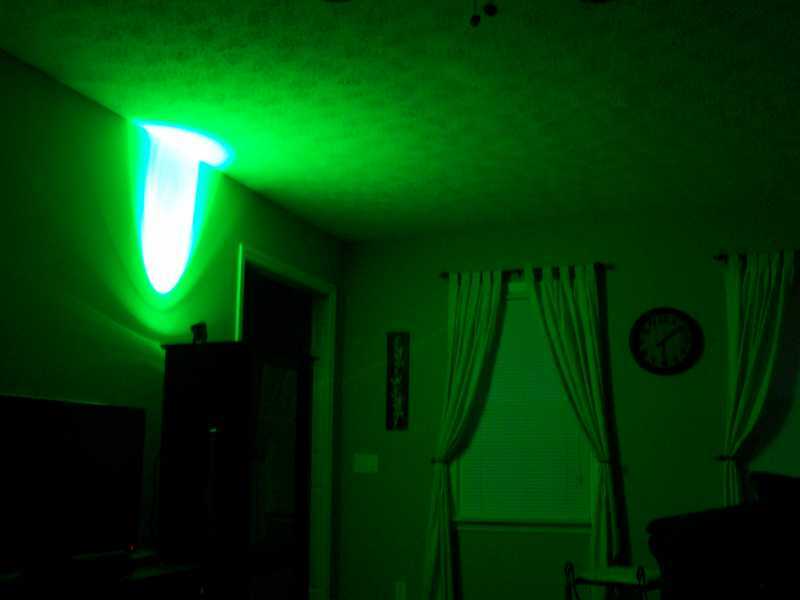 I bought 4 20 watt green LEDS for gigging flounder. 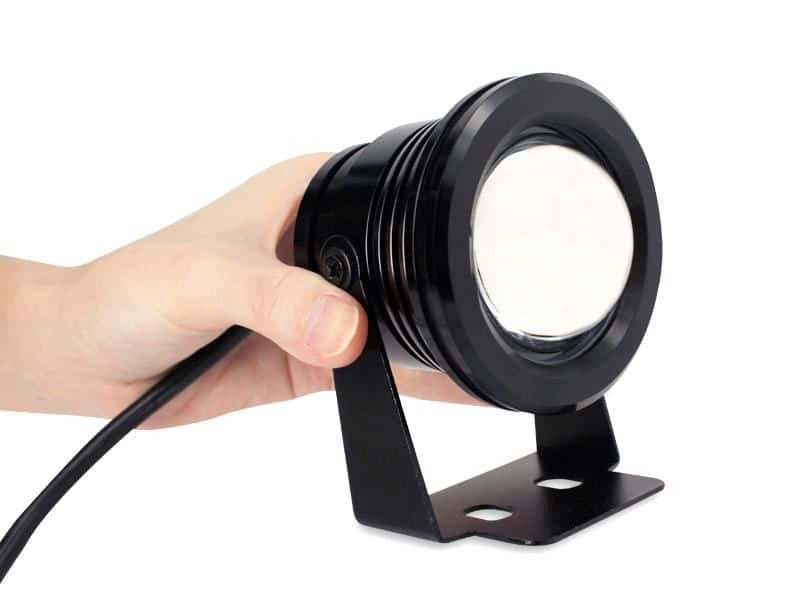 I have been using above water lights but decided to try these for underwater use and I will never go back. 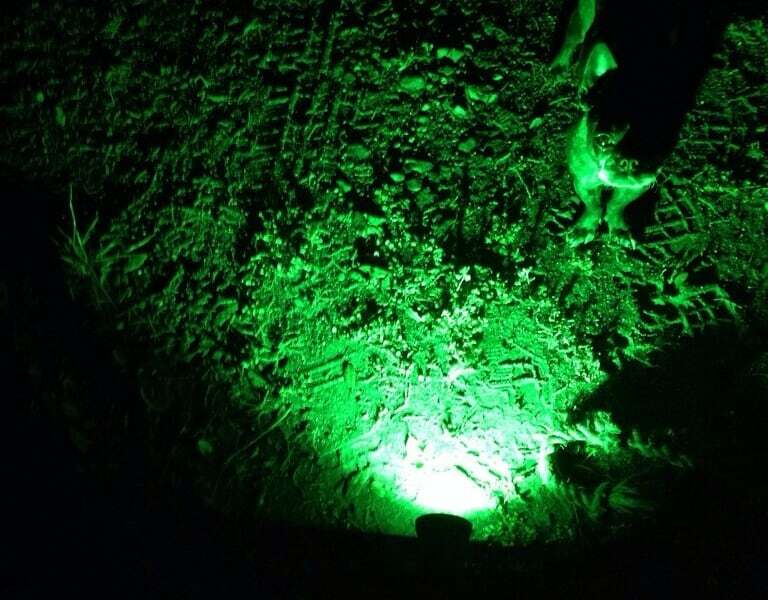 The green lights are great for murky water. I am seeing flounder way ahead of me before I get to them . 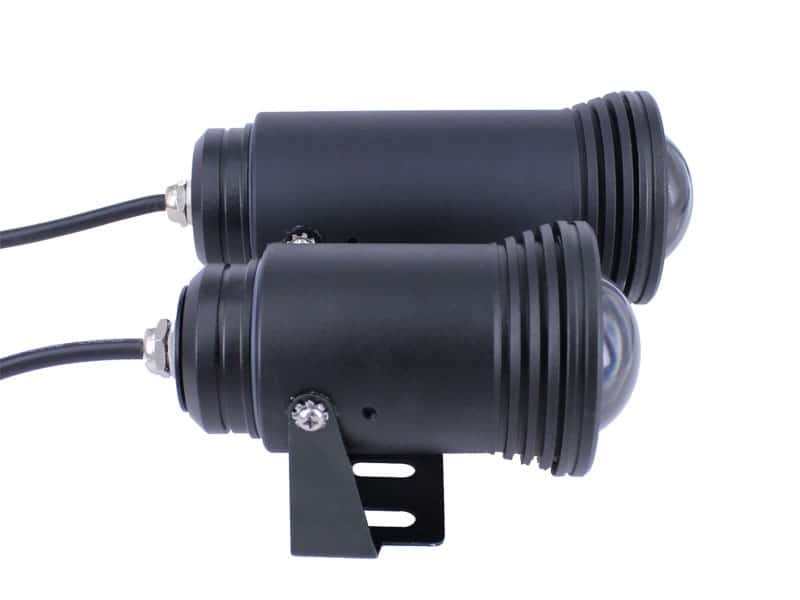 I highly recommend them to anyone wanting to try underwater lights. You will not be dissatisfied. 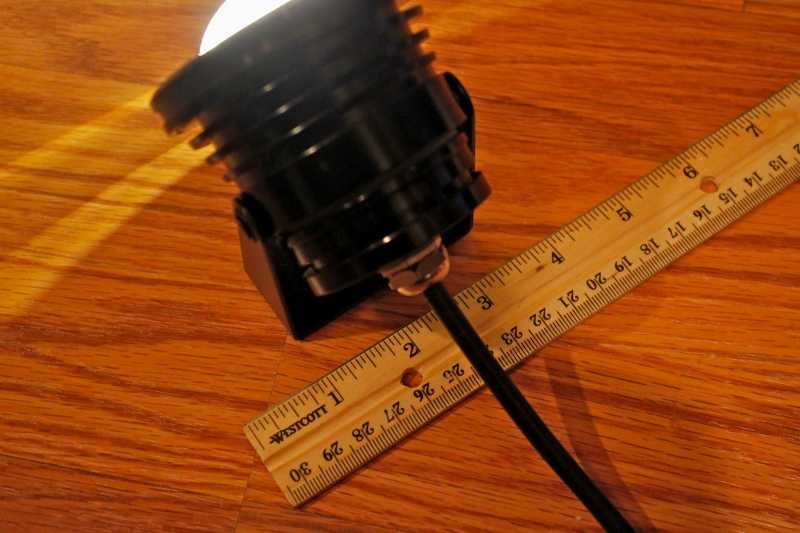 I use this to light up a 10 ft by 12 ft wall tent and it does the job perfectly all by itself. 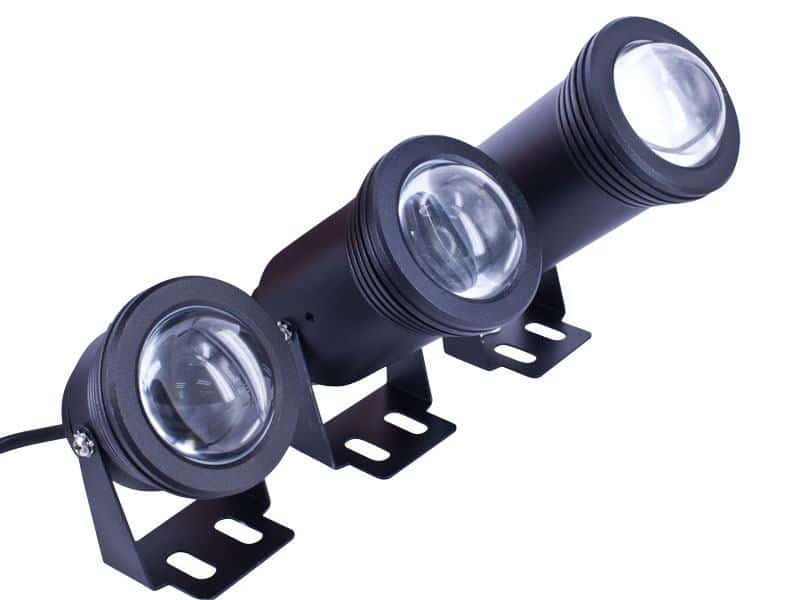 I use these on a Polaris Ranger as backup and work lights. As for waterproof, I have not had any problems with snow, ice, rain. 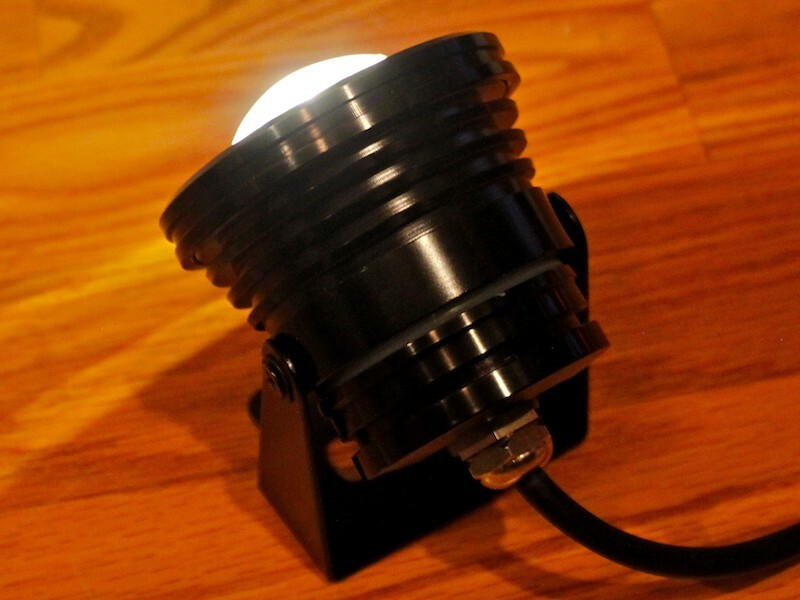 I did put a dab of silicone on the power cable entry but the lens never fogs and is very bright. I would not hesitate at all using these in an outdoor environment. They also don't show any problems with harsh environment on the Ranger and bouncing/jarring movements. 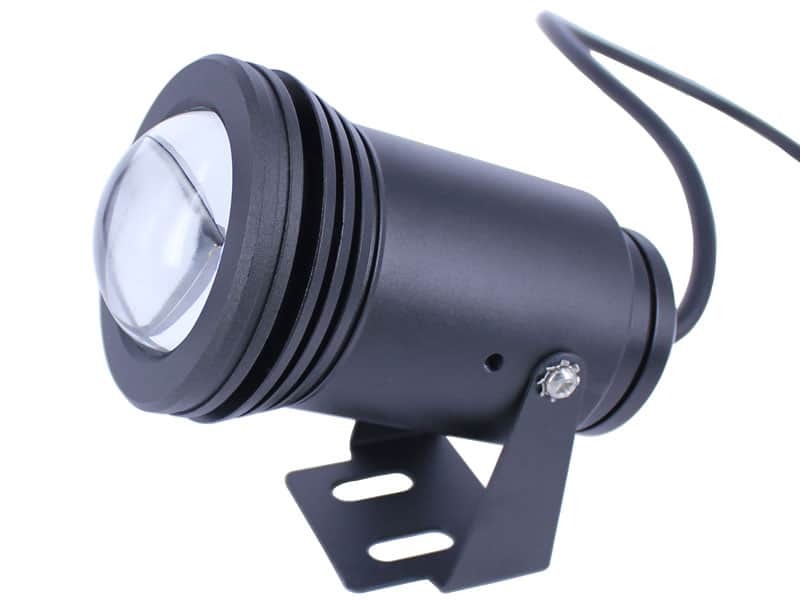 Top notch lighting for home or business. See my action shots!!! 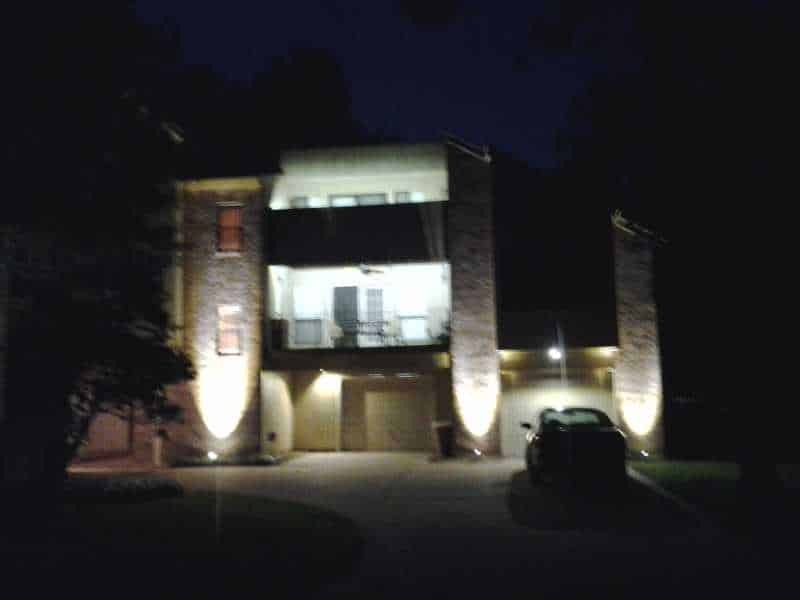 I am an electrician who has been installing home and business lighting for about 16 years. 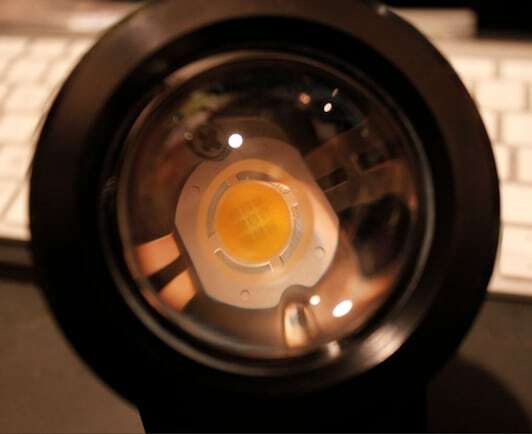 Finally the LED technology has reached a level that equals the brightness and look of warm white light. 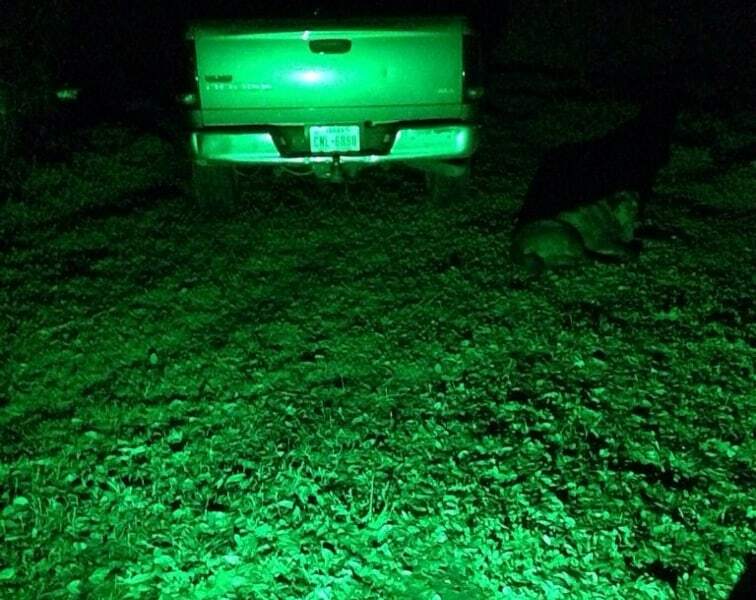 The Oznium spot (flood) lights and LED strips are the best lighting option I have found. 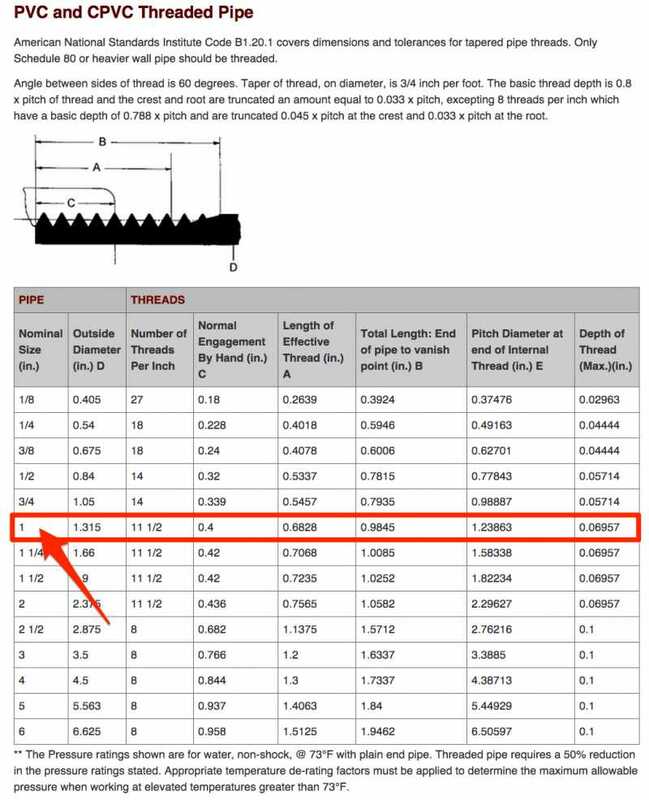 They run cool and draw very little amp load. 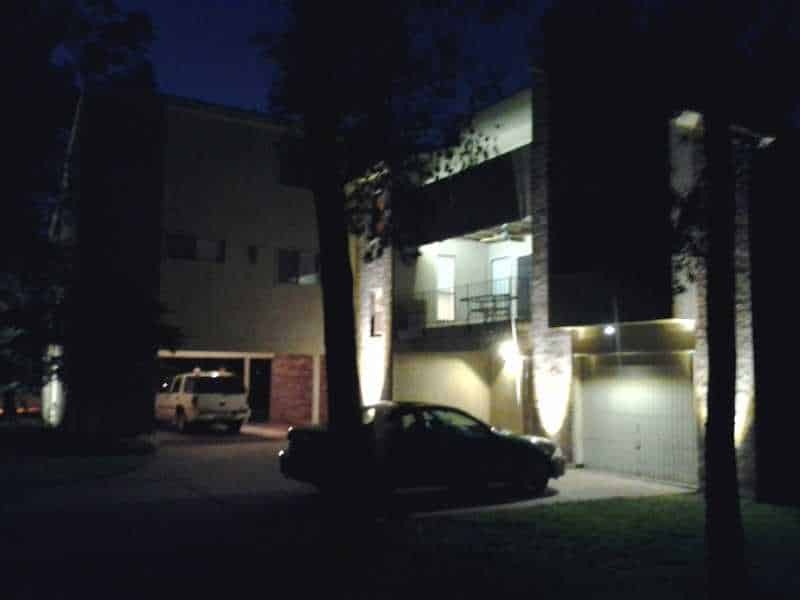 I am very pleased with the outcome of my own home lighting project (see actionn shots). 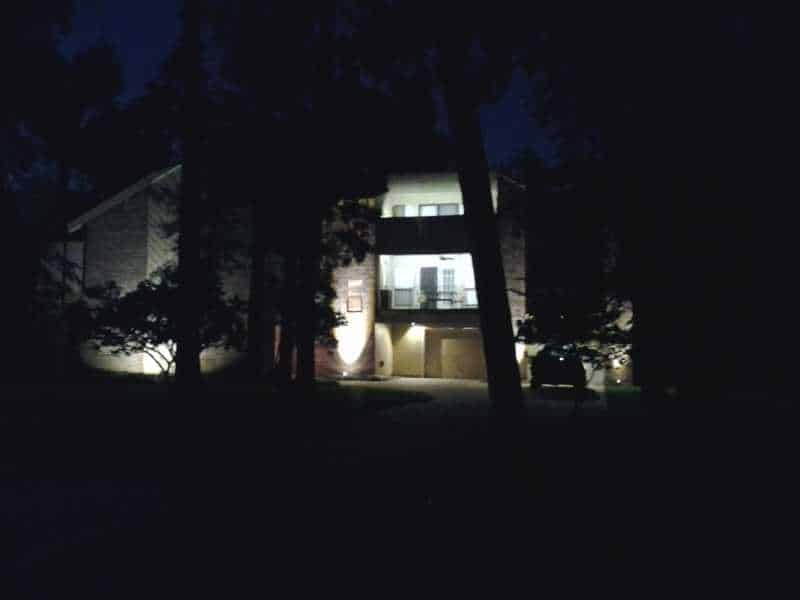 As I expand across the property I will be adding more lights to the trees and across the driveway. As a side note, shipping is super fast and customer service is top notch. The projector lense on the cool white leaves something to be desired. It is SUPER bright, but there is a dark yellow ring around the spot of light. One reason I like the cool white color of leds is because it gets rid of the ugly yellow light you get from incandescent bulbs. With the flat lense, you do not have this issue, it still works fantastically. Yes these are bright! One issue with the color of the projector may or may not be the gasket that they send with. 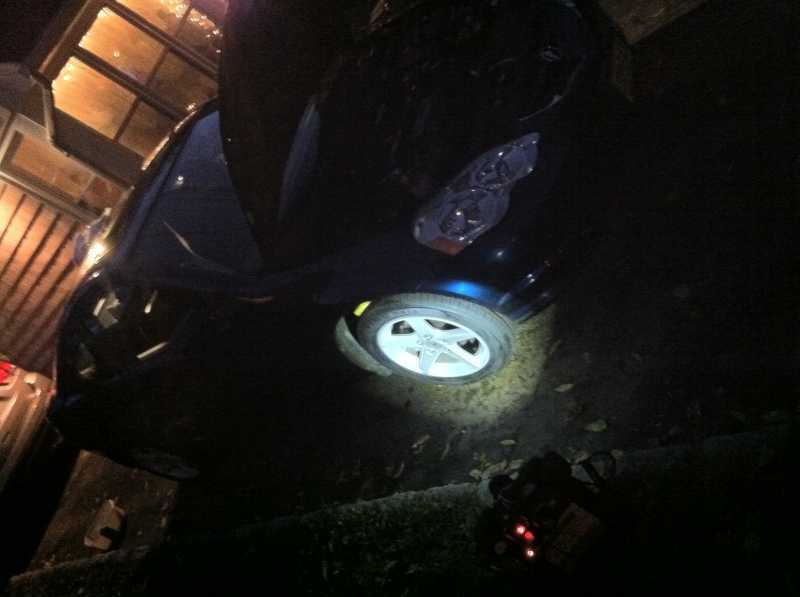 Maybe some of the light being out put is going through that gasket? 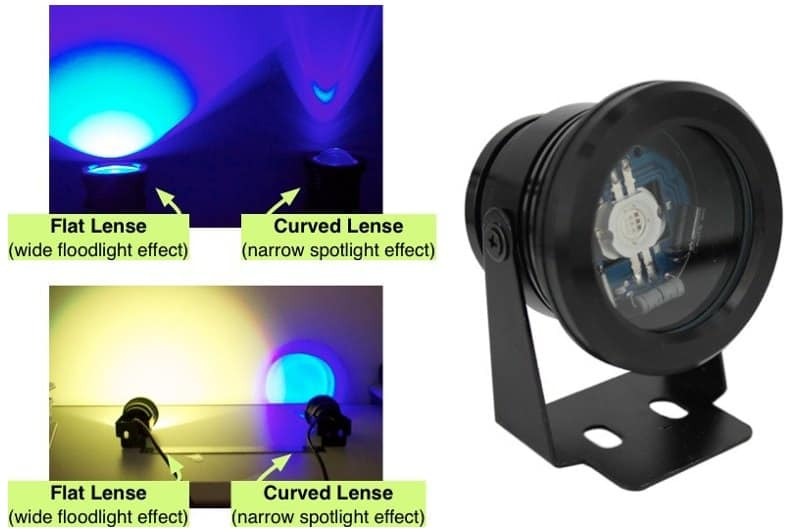 If your buying these specifically for the projector, plan to modify it unless you don't mind the yellowish ring of light. I havn't used it a lot yet but still an awesome product. As soon as I find a definitive use for it I am sure I will be purchasing more. their is still room for improvement, especially on the RGB. It is bright, but anything with a direct light output is, overall i'm satisfied with the price i paid. 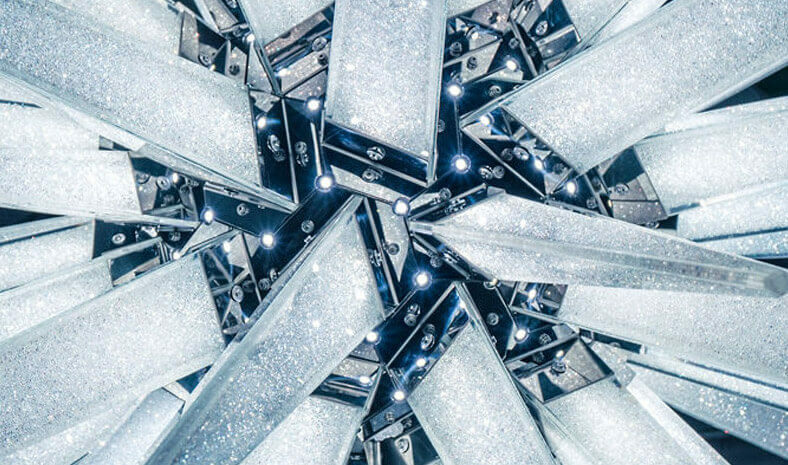 Yes, this lights is truly as bright as they say. Not only is it bright as all get out. It's massive!! 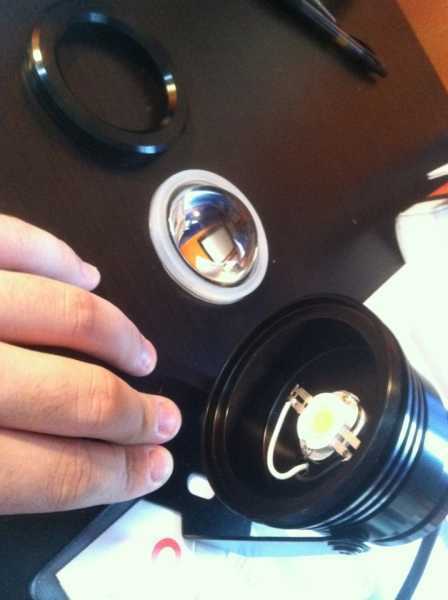 The biggest LED I have personally ever had or played around with. I got this for free from oznium, they sent me the warm white which is pretty dang bright for being "warm". But when I first got this item I was so excited to see if this thing is truly as bright as they claimed. The first time I plugged it into the outlet, BAM!! This freaking spotlight lit up my entire room. I also will include some photos of it taken apart and compared to a 1000+ page college math book!! 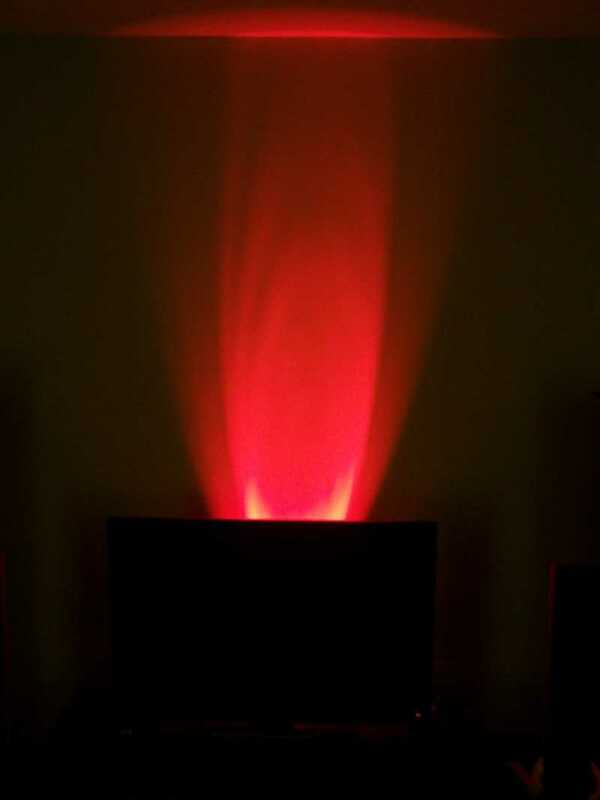 This item would be great as accent lighting in a restaurant setting or any indoor setting. 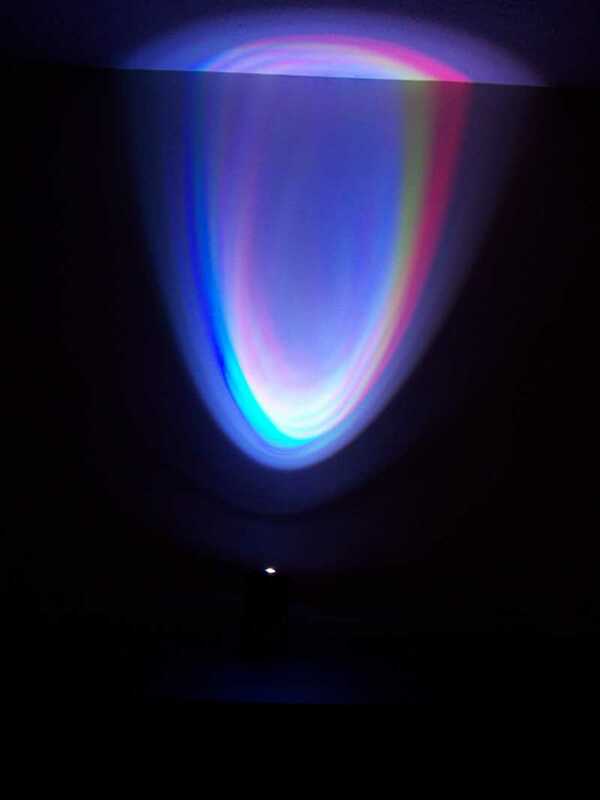 I plan to use this light in the interior of my car next spring/summer. 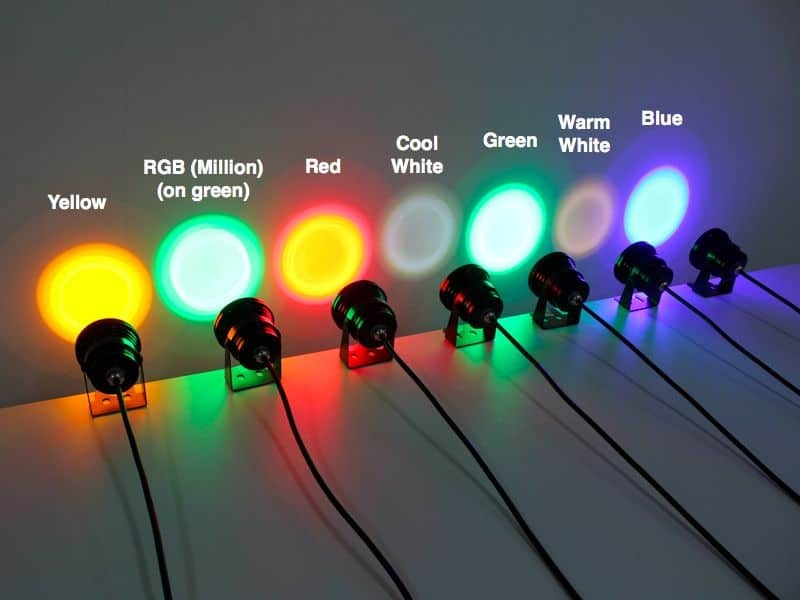 But I will most likely order a RGB spotlight so that I can have multiple colors!! Thank you Oznium for the awesome LED!! 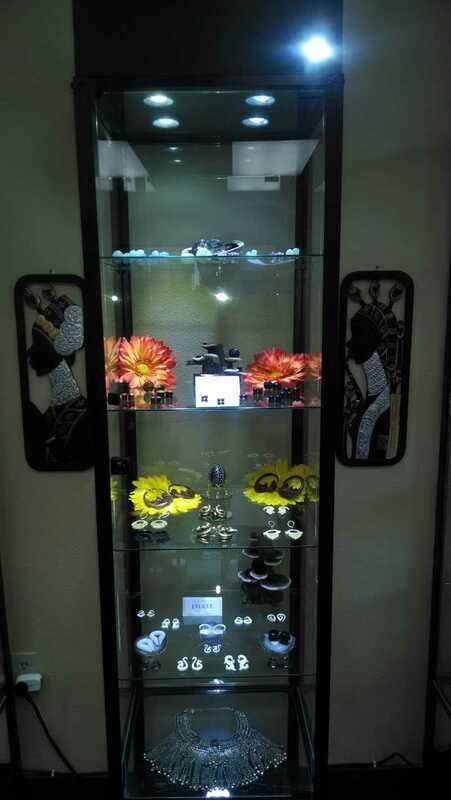 I look forward to using more of your products in the future!! THIS IS AWESOME!!!! Yeah, caution, don't be an idiot like me and look into it when you turn it on, I PROMISE you will see nothing for about 3 minutes. anyways, this thing is EXTRAORDINARILY bright! 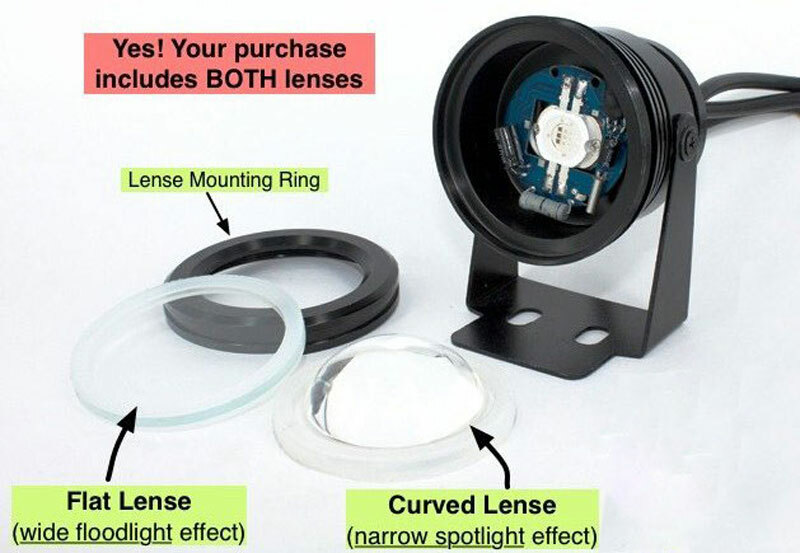 There is a easy way to remove the lenz, and it is absolutely awesome. with and without the lenz. 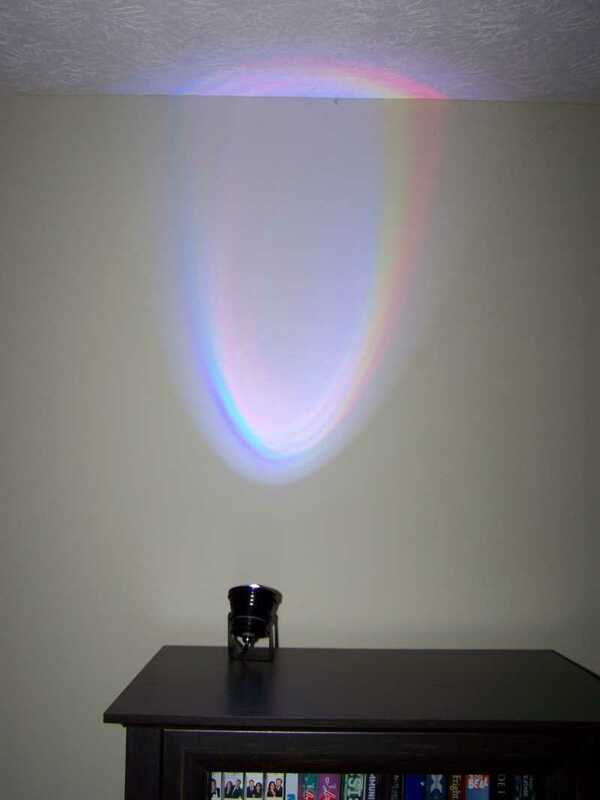 With out the lenz, it really brightens up the entire room. 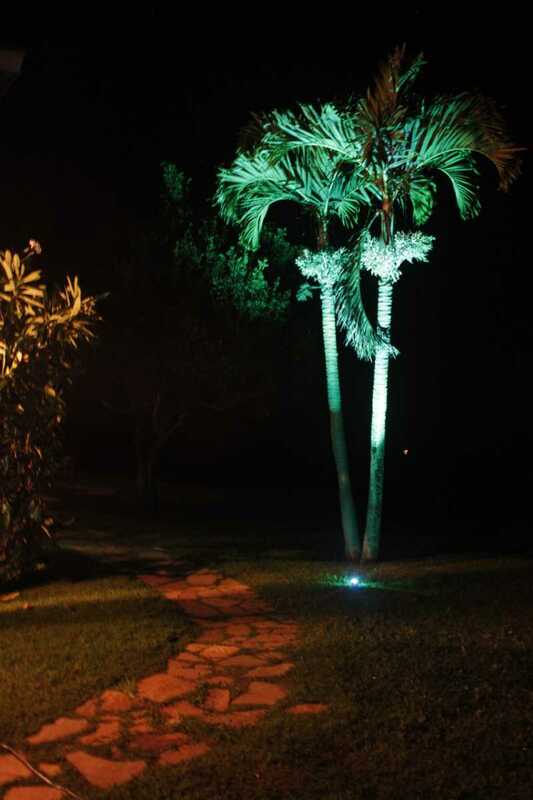 With the lenz, it would put a spot light on whatever you're trying to look fabulous! Pics will be coming within 48 hours. 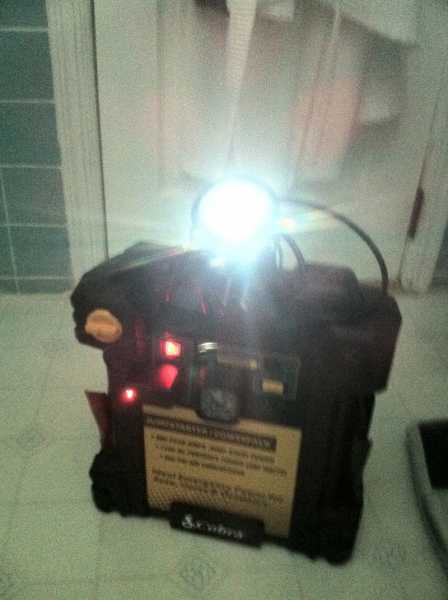 I originally was thinking of putting this in my car for a little added lighting effect, but WOW, it's way too bright! 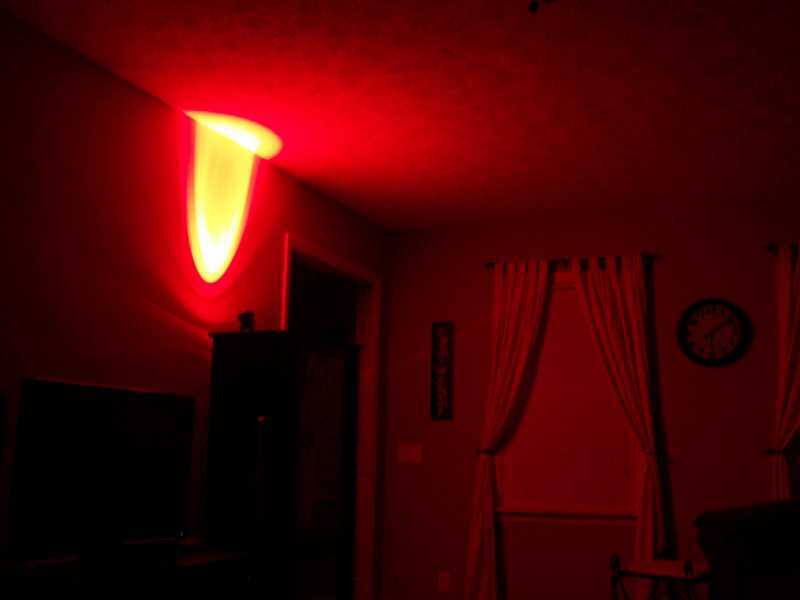 I put it in my bedroom and it lights up the whole room! I have the RGB version and every color is super bright! I really like the different functions and how it changes colors. 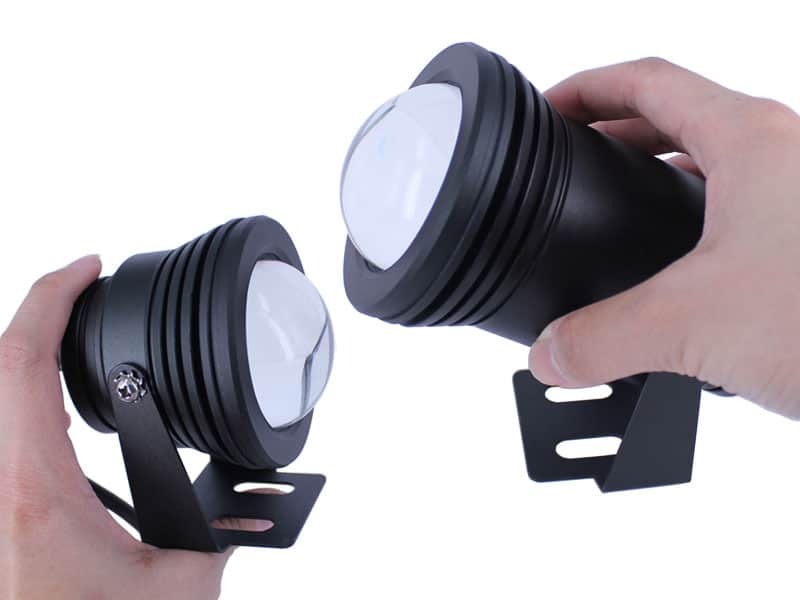 Great for any lighting application! Oznium did it again!